Running competitions enables you to engage contacts within your database in a way that no other online marketing does. It allows your contacts the ability to interact with your brand. Most of the time marketing is so focused on pushing information and promotions out to it’s customers, that it seldom has the opportunity to have customers engage. Competitions enable patrons to do just that it gives them a chance to interact and express interest. This in turn keeps them engaged and increases their loyalty. For this reason MyGuestlist recommends running competitions regularly. Within your MyGuestlist account there is a Competitions tab which will allow you to setup and manage a number of different competition types. The Instagram Hashtag competition is an online competition that is designed to raise brand awareness and increase brand exposure on Instagram. The actual competition will be run directly in Instagram, but you would set it up in the Competitions section of your account to manage valid entries. Contacts who use the hashtag and then delete their post are monitored and counted as invalid entries. Which makes choosing a winner much easier for you. With a Like/Follow Social Profile competition, you can offer people a chance to win your competition simply by liking your Facebook Page, or following you on Twitter. People who already like your page or follow you don’t miss out, as they can also enter for a chance to win. Refer a Friend Competitions have the ability to reach a broader audience which can greatly help your competition and grow your database. 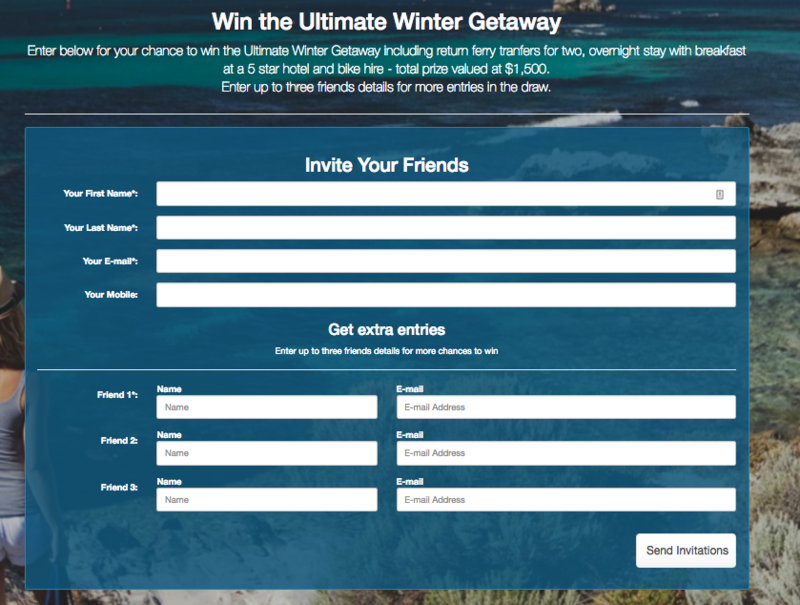 With a Refer a Friend Competition, the entrant is required to enter their detail (which are added to the database) and invite a friend to also enter (not added to the database). When the entrant puts in their friend’s email address, an email is sent to the friend inviting them to enter. Once the friend enters the competition (they’re added to the database) and invite another friend to enter, the first entrant is added as a valid entry into the competition. A Question and Answer or Creative Answer competition, allows you to ask the contact any question (or questions) you would like. When entrants enter this competition, they’re automatically added to your MyGuestlist database, and their answers can be emailed to you directly. A Tweet/Post Competition is a great way for your brand to gain exposure. Competition prize acts as incentive for people to tell their friends and followers about your competition. When someone shares your competition on Facebook or Twitter, they’ll receive an entry. The Competitions section of your account has a lot of versatility and allows for customisation of each competition type selected. Competition types can be stacked, or combined to make things a bit more complex and to give contacts additional entries. If you are interested in finding out more about the Competitions tab, or would like some help setting up your next competition, please don’t hesitate to get in touch with your Account Manager.